Book – Who’s In Charge Anyway? When a child starts to become independent. The connection between toddler play and becoming capable. The importance of risk-taking in child development. That kids need to be allowed to play outside and to walk to school. The streets are safer than you think. Why parents need to look after their children first. What your children need to know before they leave home. This book will be of interest to all parents. Whether your child is a baby or a teen, you have an important role to play in helping him grow up to be a capable adult. E-book can be read on Kindle, Tablet, iPad, iPod and smart phone. 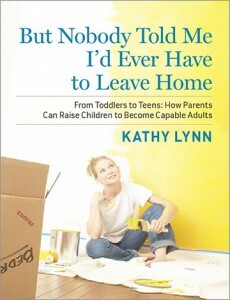 Kathy’s book is packed with wisdom and humor gleaned from her many years of speaking with parents and raising her own now grown kids. From the writers/ stars of Moms the Word, the critically acclaimed international hit comedy for parents.